Rare Air | A Parachute. A Fan. And Majesty. A Parachute. A Fan. And Majesty. 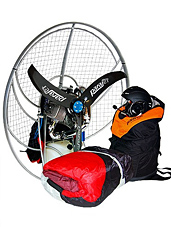 Talk about fan- and parachute-based personal flight for a minute. Introducing Parajet, a potentially revolutionary opportunity to go to Spain and learn the art of motorized parachute travel, accepting test subjects now. What you have here is a parachute, a fan-engine and a handful of training sessions. It’s almost disconcertingly easy. But let’s be clear: we haven’t attempted this. We haven’t seen it done in person. You don’t even need a license to do it. But think about it: best-case scenario, you could be soaring through the air, overlooking mountain ranges and rolling hills in your spare time. Worst-case scenario: just, you know, let’s not think about that. It’ll happen like this: you’ll sign up for the 1-2-3 Let’s Fly Paramotor Package, which includes your new equipment, plus a week of training either near coastal Spain or Great Britain. All from what they call “Europe’s leading paramotoring school” (it’s the Sorbonne of flying through the sky on a fan). You’re going to learn everything you need to know to fly solo, including some meteorology and air law. And in the end, you’ll take the pilot-level exam to be certified as a full-on pro. Next stop: Super Bowl halftime show.